We just posted an update to QTKitVDIG (version 1.0.8) which is our first attempt to address the fact that there are two different models of FaceTime HD cameras: those with a native resolution of 1280x960 and those with a native resolution of 1280x720. You may find this update useful. NOTE: As of CamCamX 2.0.8, these drivers are no longer necessary. New drivers for the CamCamX2.app (Mac App Store) allow live streaming to Adobe Flash (in Safari 8) on Yosemite and Mavericks. 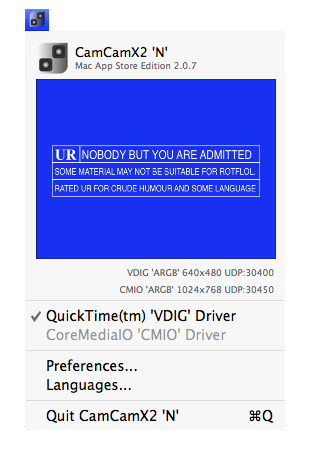 The new driver is also much faster and compatible with recent versions of Skype. Download from our CamCamX2 support page or from BLKOPCCX2MAS_esd.dmg. What problem are we trying to solve here? Well, it's like this: CamCamX2.app runs in a security sandbox. Safari.app runs in a security sandbox. Our new magical elf (aka the driver) routes the CamCamX2 mixer output back into Safari and Skype as a virtual camera input. Don't forget to disable App Nap for both CamCamX2.app and CamCamX2Menulet.app (camera driver). Safari 8.03 + Adobe Flash - Webcam - COMPATIBLE with CamCamX2 (Mac App Store).